There’s murder on the menu! It’s 1947 and as actors and actresses you’ve all been invited to a party being held to celebrate the resumption of film making at Pynewood Studios after the War. The auditions for Stefan Spellbinder’s latest blockbusting movie “Dying to tell You” are to be held in the morning and everyone who is anyone in the film world will be at tonight's "star studded" gala. Please arrive at 7pm for an evening of intrigue, deception and super sleuthing. You’ll enjoy a drinks reception (glass of prosecco/bottle beer), a delicious 3 course dinner followed by tea/coffee & mints. 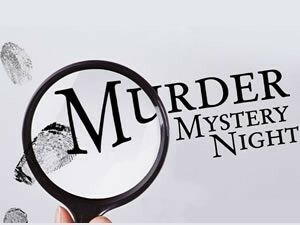 Throughout the evening you’ll have plenty of opportunity to watch events unfold and try your hand at solving the murder. You’ll be provided with a chance to make your accusations before the true murderer is revealed. Please feel free to attend the party dressed in 1940’s costume or black tie/red carpet glamour. Tickets for the evening are £49.50 per person. Numbers are limited and it is advisable to book early to avoid disappointment. All tickets must be pre-booked with a non-refundable £20 deposit taken at the time of booking. Please call 07483 118857, email info@hmbarkendeavour.co.uk or speak to a member of The HM Bark Endeavour crew to reserve your place now.